Here's a great example of the Revengeance art creation process. 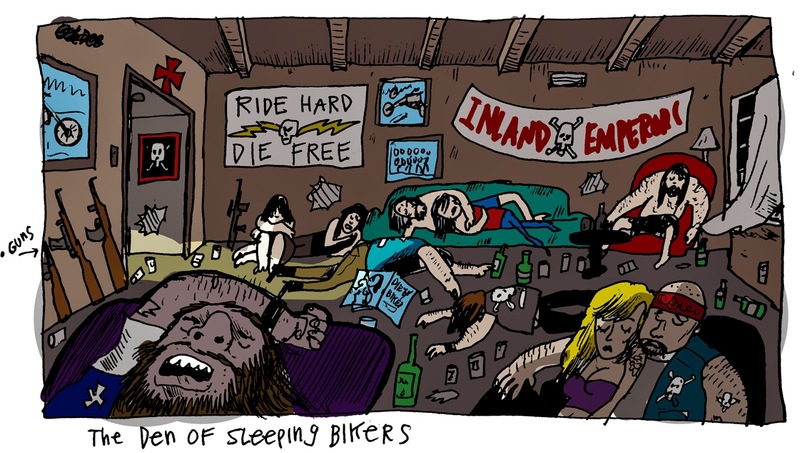 Jim Lujan designed the biker den, complete with slumbering bikers, posters for the motorcycle club, beer bottles, girly calendars, wood paneling -etc. Once Lujan finishes the design, he hands them off to Bill Plympton who goes to town on them adding his own style and flare. Colors are matched (like in this case) or modified by Sandrine Plympton. And there you have it- The Revengeance art creation method. A fully effective and cool hybrid between both artists own unique styles! ROAD TO REVENGEANCE #4: BILL DRAWS! Introducing a new web series of behind the scene segments for Revengeance. This is an ongoing series of shorts that will preview the people behind the film, the look of the film, and the actual creation of this animated feature.